Celtic made a pre-tax loss of almost £4m in the year ending 30 June compared to a profit of £11m the year before. The Scottish Premiership winners attribute the change in fortunes to a drop in transfer revenue and failure to reach the Champions League group stage. The figures do not take into account the £13m sale of Virgil van Dijk. 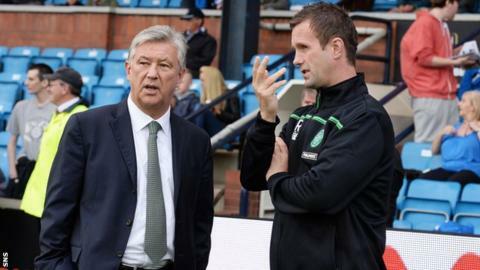 Chief executive Peter Lawwell described last season as a "transition" on the park under new manager Ronny Deila and a "challenging" one off the field. Revenue fell by more than a fifth to £51.1m. Celtic still made a £6.8m gain on transfers but that was down from more than £17m in the previous 12 months. They sold goalkeeper Fraser Forster to Southampton last summer for £10m, spending almost the same on Stefan Scepovic, Stuart Armstrong, Gary Mackay-Steven and a series of loan signings. "Our decision not to transfer certain players' registration during the period, together with failure to progress in the Uefa Champions League, have had a significant impact on revenues and profits," said Lawwell. "Our core strategy remains focused on a football operation with a self-sustaining financial model and relies upon the youth academy, player development, player recruitment, management of the player pool, and sports science and performance analysis, to deliver long-term sustainable football success." Like last season, Celtic have missed out on the Champions League this term and will begin their Europa League campaign against Ajax on Thursday. "Our objectives this year remain success in all three domestic competitions and in the Uefa Europa League, playing creative and exciting football," added Lawwell. "We will continue to build on the foundations that have been laid and focus on qualification for the group stages of the Champions League, which is where this great club belongs."